Navy Pullover Sweater with Three Quarter Length Sleeves, "Evening Flight in Navy"
Enjoy putting on this soft, cozy pullover sweater from Peruvian artisan Nestor Yana. Made from a blend of acrylic and alpaca wool, the lightweight navy sweater has a comfortable cowl neck and three-quarter length sleeves. 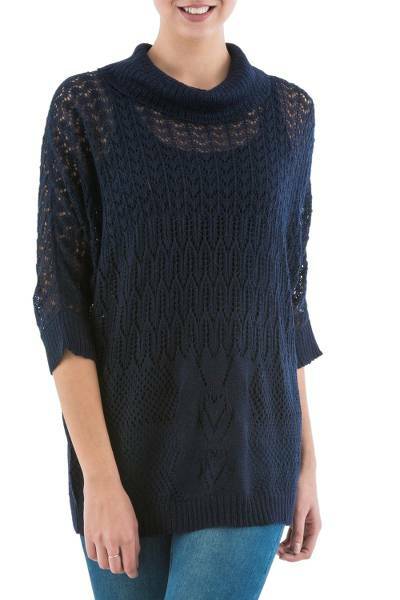 You can find pullover sweater 'Evening Flight in Navy' by Nestor Yana in clothing categories such as Acrylic Blend Sweaters, Alpaca Sweaters, Alpaca Wool Sweaters, Nylon Blend Sweaters, Nylon Sweaters and Pullovers Sweaters. Enjoy exploring these sections for other Novica treasures. This is a very pretty sweater. As the photo shows, you do need a camisole underneath. I'm an XL and ordered the L/XL size--the fit is generous, but not sloppy. The arms are slightly bat-wing, which is a flattering cut for this type of knit. My torso is long and this sweater covers everything to the upper thigh. As I did with another Peruvian sweater I ordered, I washed this in liquid castile soap, rinsed, and let soak in a strong vinegar solution before rinsing again. Some dye did come out in the wash but the vinegar set the dye. I suspect this is a manufacturing challenge to do with the alpaca wool (my other sweater bled more, and has 4X the alpaca content). Not a problem--I wash new clothes before wearing them anyway. I really like this sweater. The cut is flattering. I can wear it with a skirt to the office or with jeans at home. Yes, you do need a camisole underneath it. I washed it in the machine with cold water and laid it flat to dry. That works perfectly, no need to hand wash. I did add some vinegar for the first wash, but none after that. I would love to have another one in gray, but my size is not available!